For more than a month, a student in Alma Vela’s first grade classroom at Washington Elementary in Woodburn complained of a toothache. Sometimes, the pain would bring the young girl to tears. When the pain became so unbearable she couldn’t concentrate in class, the student was sent home with an application of OraGel — which was really the only form of dental care she’d ever known. Because of her immigration status, Vela’s student had gone her first seven years without having ever seen a dentist. On this occasion, she ended up missing several days of school because of the pain — and the toothache became a big point of conversation at parent-teacher conferences later that month. It’s not unusual that health issues percolate in Vela’s relationships with her students and their families, particularly because of the community in which she teaches, which has the highest population of undocumented families and children in the state. Many parents come to rely on Vela for sharing resources on where to turn for healthcare when their student lacks the insurance to visit a doctor or a dentist. “I have to put myself in their shoes — healthcare is not just something that only affects the individual student. It affects the entire family,” Vela says. For Vela — seeing her students struggle to access the healthcare they need brings the memories flooding back from her own childhood. Her own mother immigrated from Mexico to Woodburn with four daughters, and a year after their border crossing, Vela was born. Because she was the only natural-born United States citizen in her family, Vela was enrolled in the Oregon Health Plan while her four other sisters went uninsured. Though she had insurance, she moved through her childhood in same manner that her older sisters did — rarely seeing a doctor unless the matter was urgent. “I only went to a doctor when it was severe. Even though I did have coverage, it was very difficult for my mom to get out and make appointments, or be informed of the resources that were available then,” Vela says. This year, undocumented students like Vela’s are on the brink of a major shift as far as their healthcare is concerned. House Bill 2726 — also referred to as the Cover All Kids legislation — will ensure that a child’s access to health insurance is not determined by immigration status. If the bill passes this Legislative session, all children under the age of 18 — documented and not — will have access to health insurance through the Oregon Health Plan. An additional 17,600 kids will gain insurance if the bill passes. Above: Isabela* and her two-year-old daughter Aaliyah meet with Salem school nurse Cindy Hoffert, below, to discuss Isabela's options for Graves Disease treatment without insurance. On Feb. 20, Gov. Brown testified in support of the Bill in front of the House Committee on Health Care. "It is our duty to ensure that our youngest Oregonians have the tools to grow into healthy adults with access to education, health care, and a bright future," Brown was quoted in the Statesman Journal. "Oregon children should have the opportunity to be healthy and ready to learn, and Oregon families should feel con- dent that a medical event will not dramatically change the trajectory of their lives." The Bill’s chief proponent is the Oregon Latino Health Coalition (OLHC), a collaborative group of 90-plus individuals and organizations (including the Oregon Education Association) dedicated to promoting health and wellness and reducing Latino health disparities through advocacy, prevention, education, and sharing of resources. On a policy front, the Coalition develops statewide legislation that will reduce disparities within Latino communities. Their work began with a legislative campaign in 2015 to bring health care to all children, which became the launch pad for the 2017 legislation currently under consideration. The Coalition sites important facts for prioritizing the Bill — namely, educational outcomes. According to studies done by Harvard and Cornell Universities, insured kids are 9.7 percent less likely to drop out of high school and 5.5 percent more likely to graduate from college. 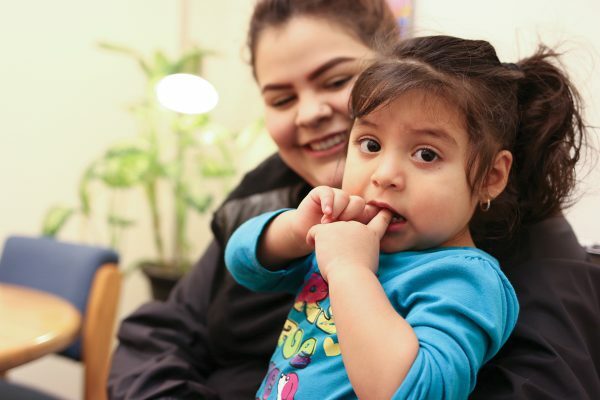 An OLHC report published for the 2015 campaign states that “Health insurance coverage for undocumented children could also help Oregon close the achievement gap. Low-income children and children of color, a growing share of the state’s student body, lag in their educational achievement compared to more affluent white children. The achievement gap threatens our economic competitiveness and our capacity to innovate.” Over the past 10 years, the advent of the State Children’s Health Insurance Program (SCHIP) and the increased push for children’s coverage have led to marked declines in the number of uninsured children. Nevertheless, a great deal of work remains to be done. While the Affordable Care Act extended affordable insurance options to millions of Americans, undocumented immigrants have been left out of health reform. The most recent Census data show that, for the first time since 1998, the rate of uninsured children has increased, going from 10.8 percent to 11.2 percent. One in nine children is uninsured, with more than half of all uninsured children living in two-parent families. Those numbers hit home for Aldo Soldano, the Campaign Community Organizer for the Oregon Latino Health Coalition and graduate of Woodburn High School. Soldano immigrated to the U.S. with his family when he was six years old, and grew up in low-income farm worker housing. His family came seeking a better life for their children, and in Woodburn, they found it — but not without its own struggle, too. Soldano remembers how cautious his childhood was. He never played sports because he couldn’t risk getting injured without family health insurance. He laughs as he remembers secretly longing to break an arm so that he’d get to come to school with a cast and have his classmates sign it. “It’s kind of a rite of passage. I remember thinking, I want to break my arm, but I knew that if I did, I wasn’t going to get a cast. In that way, not having health insurance can really take away from your childhood,” he says. “I am fortunate that I have a mom who is super resourceful. She understood what our situation was, in terms of status, and what we qualified for. If there was a free clinic at school, we'd get a quick check-up. A lot of families just get by like that. But it's not consistent, it's not enough. It's not the type of care that you really need to thrive,” he says. When he turned 18, Soldano applied for Deferred Action for Childhood Arrivals (DACA), President Obama’s American immigration policy started in 2012 that allows undocumented immigrants who entered the country as minors to receive a renewable two-year period of deferred action from deportation and eligibility for a work permit. Through DACA, Soldano found full-time employment and, for the first time, qualified for health insurance through his employer. “It wasn't until I started working full-time and got benefits that I ever saw a doctor. Prior to that, I fully understood what the consequences were, and I understood the fear,” he says of not having health insurance. Soldano knows that even if the bill passes, anxiety will continue to be an issue. The current anti-immigration climate in the era of a Trump Administration has justifiably instilled a sense of fear in families with undocumented children. The Trump Administration has said it plans to increase immigration enforcement efforts in the U.S., with a particular focus on people living in the country illegally. This has hit the community of Woodburn particularly hard in recent weeks — in February alone, federal immigration agents detained more than a dozen members of Woodburn’s Latino community. Soldano says that for many families right now, healthcare is synonymous with government, and government is not a friend. If Cover All Kids becomes law, a big challenge will be getting the information to families to enroll their children in Medicaid — a government program. Soldano says the responsibility will fall to community organizations who have developed trusting relationships with the communities they serve. “Because of the political climate right now, it wouldn't be strategic for enrollment purposes to do it solely through county services,” Soldano advises. He’s fully prepared for the Oregon Latino Health Coalition to step up to the plate and continue their outreach and advocacy work to ensure the students who need healthcare are getting it. Educators, he notes, also play an important role in seeing this step through. On a Spring day at the Early College High School (ECHS) in Salem, school nurse Cindy Hoffert stops in to check on a few students she’s been asked to help triage. One of these students is Isabela* (*Name changed to protect privacy), an 18-year-old undocumented student in ECHS’s Teen Parent Program. Two years ago, while pregnant with her daughter Aaliyah, Isabela was diagnosed with Graves Disease, an autoimmune disease of the thyroid. If she had not become pregnant and been covered by insurance for those nine months, Isabela's condition may very well have gone undiagnosed. Now, because she’s no longer covered by the Oregon Health Plan but is a legal adult (albeit still a student), she is unable to access the treatment she needs — though she continues to struggle daily with symptoms of the disease, like severe swollen throat, glassy eyes, weight gain and low energy. From time to time, Isabela has been able to access the low-income clinics in Salem and the surrounding areas for immediate health concerns. Still, she walks away with a minimum $500 bill after each visit. Some issues go untreated — she’s using a 4-year-old inhaler to treat her asthma and suffers anxiety — all while raising a toddler and attending school full time. Hoffert says the Cover All Kids legislation could make a world of difference for a student like Isabela – and for all the migrant students with whom she meets daily. 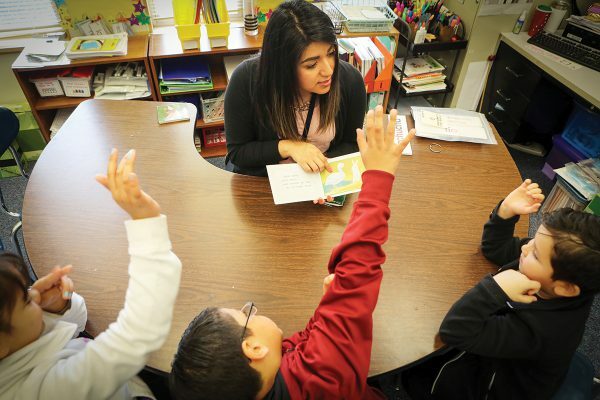 For Alma Vela, returning to teach in the community where she grew up was always top priority. "Woodburn is where my heart is," she says. Year after year, Hoffert’s school nurse caseload continues to grow. 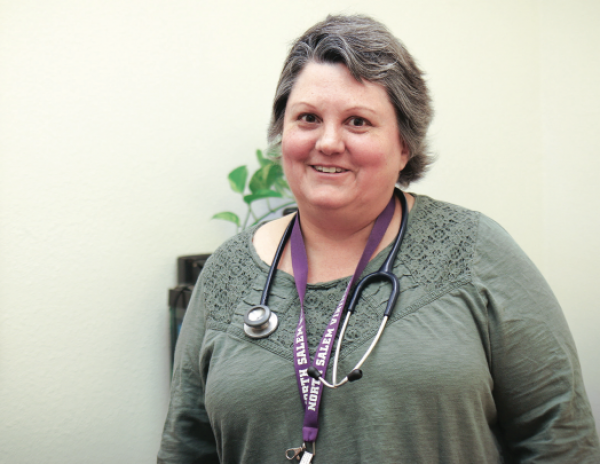 She’s been working as a nurse in Salem-Keizer secondary schools for 16 years, and currently serves North Salem, McKay, and all of Salem's alternative high schools. Each of the school nurses in Salem averages a caseload of around 3,500 students per nurse. “That’s just sheer numbers — but then we add in the kids who require tube feedings, insulin shots and other issues that require you to be physically present for them every day,” Hoffert says. A large part of Hoffert’s day-to-day work is helping families navigate how to get a very sick child the care they need. “The reason I have to ask is because I don’t have as many options for you, if you aren’t,” Hoffert says. “I used to feel really bad telling parents that — but now I can say, ‘my hands are tied and it’s no one’s fault’.” Every year, she calls around to various clinics to see if there are any new resources for immigrant families, but each year, the available resources seem to dwindle, even from where they were 10 years ago. When she hits a dead end, she’ll reluctantly tell a family that the only remaining option is the emergency room, which cannot deny care to anyone, no matter their immigration status — though Hoffert knows full well they’ll end up with a bill of at least $2500 from the visit. Of the new legislation, Hoffert has hopes that it will result in more preventative care from the outset, lessening the need for those costly ER visits. Of course, legislation like this comes with a price tag — currently estimated at $55 million. Soldano says there are creative ways through revenue reform to fund both this program and other valuable services in jeopardy right now. Gov. Brown has included the expansion in her proposed budget, allocating $55 million in General Fund money for 2017-2019. Studies done by the American Journal of Public Health have repeatedly demonstrated that the uninsured are less likely than those with insurance to receive preventive care and services for major health conditions and chronic conditions. The Oregon Latino Health Coalition says the Bill will ensure access to health care prevents treatable illnesses from becoming expensive health care crises — saving the state money in the long-term. Similar policies to Cover All Kids are already in place in California, Washington, New York, Illinois and Massachusetts. While the Bill has broad bipartisan support, it also faces some staunch criticism from anti-immigration groups, who cite Oregon’s $1.8 billion budget gap as the primary reason to vote against the legislation. That view, many say, is short-sighted, noting that investment in primary care lessens costs over time, and the addition of 17,000 children to the Oregon Health Plan would represent just over 1 percent of the entire plan’s population. For Soldano and Hoffert, the issue comes down to equity for all students. “There is this little voice stuck on the conversation of immigration, and using the ‘I’ word to define these kids. That's not giving them the place they deserve. It is a dehumanization of the issue from what it really is,” Soldano says. Hoffert agrees, and says Cover All Kids could level the playing field for our students — and educators alike. “If we have 40 kids, 37 might have health insurance and three don’t. Those three students aren’t equal, but they should be. They are a part of our school community; they undergo the same level of rigor that all other students do, but they lack the access to the services that other students have.” Ensuring all students regardless of immigration status have equal access to healthcare could make the work of educators and school nurses that much more seamless and effective, too, Hoffert says. She looks forward to the day when she can approach each of her students’ needs from the same lens and provide each of them the same resources.